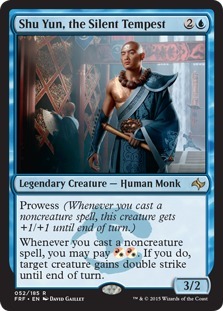 Shu Yun, the Silent Tempest has a CMC of 3 (2U) so he’s square in the middle of Sram (1W) and Jhoira (2UR) when it comes to mana cost. So he comes out a turn later than Sram, but should still be easy to cast by turn two in most cases. He’s a 3/2 as opposed to a 2/2 with Sram, so that’s a mild improvement. He has prowess, which gives him a little bit of a buff (+1/+1) for a turn if you cast any noncreature spells. Lastly, if you can pay an extra 2 mana after casting a noncreature spell, you can also give him or another creature double strike. This means that he’s able to be beefed up not only with equipment, but by casting spells and paying a little extra for double-strike. This actually makes him a better Voltron commander than Sram, though he doesn’t have the card draw benefit. That’s why I’ve included the other two Legends to help with that. Sram will draw you a card whenever casting an Aura, Equipment or Vehicle spell. 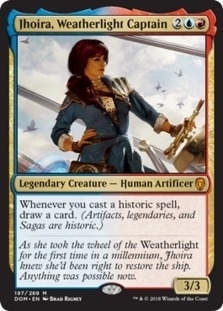 Jhoira on the other hand will draw you a card whenever casting an Artifact, Legendary or Saga. In this deck I have included only a couple of auras, a couple of vehicles, and a ton of equipment. There are no sagas, but I’ll now get to draw cards off of any artifact and other legendary creatures of which there are a few. The goal here is to get at least one of these creatures onto the battlefield as early as possible, and then start drawing cards left and right and hopefully get the other out as well. With the amount of equipment in the deck, we’ll get double the draws. There are some other draw enablers as well, but first let’s look at the equipment, as that’s the cornerstone of any good Voltron deck. Here we have a selection of cards that are going along with our theme of focusing on equipment to voltron up our commander, but also ways that help us to draw more cards and reduce costs. Vedalken Archmage stacks with Sram and Jhoira when casting artifacts, ditto Puresteel Paladin when casting equipment. Etherium Sculptor and Foundry Inspector (also Danitha) both reduce the cost of artifacts, and most of them are 3 CMC or less so it can turn a bunch of them into free casts. I’ve included the tutors that I can (and are relevant), with Gamble being the only one that can tutor up one of your card draw engines. 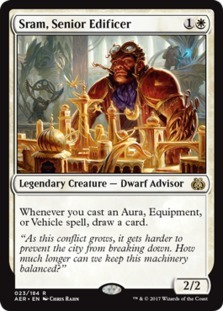 Others tutor for equipment only, or artifacts, or there’s Muddle the Mixture which is a counterspell but can also double as a tutor for something with CMC 3 in a pinch (this doesn’t help with Sram or Jhoira, but can grab one of the swords or Danitha/Foundry Inspector. Lastly, there’s Sunbird’s Invocation, which essentially means you’ll be cycling through your deck quickly and casting stuff for free more often. I think all of these cards synergize well, and I think that this deck can go off under the right circumstances. Still probably not higher than Tier 3, but a fun deck to pilot no doubt. I just recently finished this deck so I’ll report back once I’ve done some playtesting.